An event can be anything, a mailing list, a weekly meal planner, or party, neighborhood get together where many people supply the items..
Planning an event begins with entering the event's date, time, location and guest list. 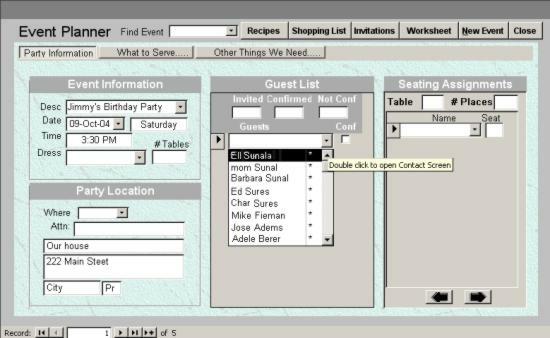 Guests/Recipients are chosen from your contact list, or entered independently. 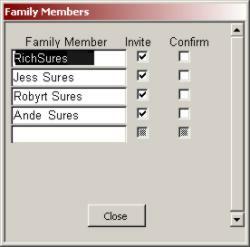 Adding a new individual to the guest list will allow you to add them to your existing contacts. If the person you chose has family members, (denoted by the * beside their name) a small window will open to display those individuals. Place a checkmark beside the members you wish to invite. When you close the window you will notice their names on the current guest list. Once an individual is confirmed, they appear on the seating arrangement list. As you seat people, they are removed from the seating list. If this a mailing list of some sort, ignore the other sections of the program and choose the Invitations button to produce envelopes. If this is an actual event, proceed to the next section "What to Serve - Things we need". The Event section is part of a greater program called My Perfect Planner.